The Kiddush Cup was completed by Hieronymus Mittnacht in 1761 and was intended for use by Jewish families celebrating Shabbat. Judaism, rich in ceremonial observances enacted through halakhah (the law that shows “the way”), employs certain sacred feasting tools for the sake of commemorating religious truths. Objects like the Kiddush cup perpetuate tradition through their artful form and function. The physical nature and spiritual significance of Minnacht’s cup conjure notions of the Sabbath (seventh-day rest) and ofmenuha (the life to come). A Hebrew phrase reading, “Guard the Sabbath day and keep it holy as the Lord God commanded you” is engraved around the cup’s rim, suggesting the holiness of Shabbat. Additionally, and perhaps more importantly in an analytical sense, its octagonal nature seems to represent the idea of menuha, or remaining in God’s presence. An annual “eighth day” holiday in the Jewish tradition that encompasses menuha as an extension of Shabbat is that of Shemini Atzeret, which follows the weeklong “Feast of the Tabernacles” during the season of atonement. The cup in its entirety characterizes Jewish hope found in the present life and in future deliverance. Celebration of this hope in drinking wine from the Kiddush Cup evokes “a delight to the soul and a delight to the body,” to use Heschel’s words in The Sabbath: Its Meaning for Modern Man. 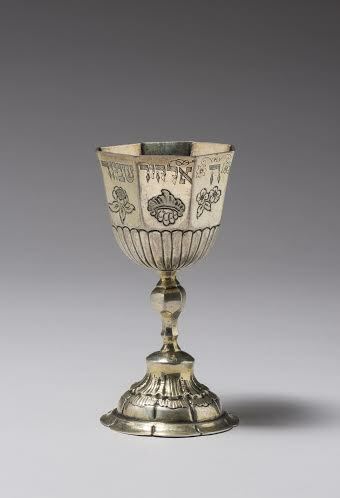 Participating in the Kiddush ritual reaped a pious pleasure for owners of this cup, a physical and religious nourishment emerging from such holy feasting. Halakhah, expounded through Shabbat (and the usage of the Kiddush cup), led Jewish families to consider menuha and the ultimate abidance in the presence of their God. Heschel, Abraham Joshua. “The Sabbath: Its Meaning for Modern Man.” New York: Farrar, Straus, and Giroux, 1951. Web. 5 Apr. 2015.